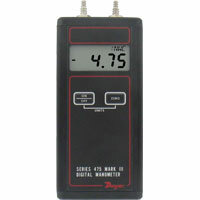 The Dwyer® Series 475 Mark III Handheld Digital Manometer is ideal for field calibration, monitoring or trouble shooting HVAC systems, clean rooms or a wide range of other low pressure pneumatic systems. This handy instrument measures positive, negative or differential pressures of air and natural gases in ranges from 1 in. w.c. (0.249 kPa) to 150 psid (10.34 bar). The Series 475-FM is approved and is intrinsically safe for hazardous locations, Class 1, Div.1, Group A, B,C, D, T4. The meter is simple toi opereate and easy to read. It is an indispensable test instrument for the plant engineer, industrial hygienist and HVAC technician. When used with a Dwyer® Pitot tube, the Series 475 Mark III can also be used as an air velocity gage. The Series 475-FM Mark III is housed in a durable extruded aluminum case with its solid state circuitry mounted on a tough fiberglass epoxy circuit board. To meet the most demanding applications and to provide stability of instrument reading, the 1" w.c. range is compensated for position sensitivity through use of a unique patented dual sensor system. A standard 9 volt battery provides up to 100 hours of operation. Dual push pads on the front panel control on-off, auto zero, and pressure unit selection. No setup or leveling. The large 0.42" LCD display is easy to read, minimizing data collection errors. Units include a "low battery" indicator. The pressure sensor used is a highly stable silicon piezoresistive device. Standard connections are dual sized for 1/8" or 3/16" I.D. vinyl or rubber tubing. Complete instructions are conveniently printed on rear of housing. New Low Range Option 0-1.000 in. w.c.
Service: Air and compatible combustible gases. Pressure Limits: See Ordering page. Resolution: See modle/range chart below. Connections: Two barbed connections for use with 1/8" (3.18 mm) or 3/16" (4.76 mm) I.D. tubing. Two compression fittings for use with 1/8" (3.18 mm) I.D. x 1/4" (6.35 mm) O.D. tubing for 475-7-FM & 475-8-FM only. 475-000-FM: 0-1.000" w.c. (.2491 kPa), max. press. 5 psig. 475-00-FM: 0-4.000" w.c. (0.996 kPa), max. press. 5 psig. 475-0-FM: 0-10.00" w.c. (2.491 kPa), max. press. 5 psig. 475-1-FM: 0-20.00" w.c. (4.982 kPa), max. press. 10 psig. 475-2-FM: 0-40.00" w.c. (9.96 kPa), max. press. 10 psig. 475-3-FM: 0-200.0" w.c. (49.82 kPa), max. press. 30 psig. 475-4-FM: 0-10.00 psi (.6895 bar), max. press. 30 psig. 475-5-FM: 0-20.00 psi (1.379 bar), max. press. 60 psig. 475-6-FM: 0-30.00 psi (2.069 bar), max. press. 60 psig. 475-7-FM: 0-100.0 psi (6.895 bar), max. press. 150 psig. 475-8-FM: 0-150.0 psi (10.34 bar), max. press. 200 psig.